The Curriculum DaVinci is more than just combining Science and History. It is characterized by its own pedagogy and didactics. Besides a full coverage of the core goals “Self and World Orientation” as well as coverage of the “Canon” (a chronological summary of 50 subjects of the Dutch history), global citizenship, civic education, and an extended vision on learning in a modern world are also key players in this curriculum. The digital board is used as well as hands-on materials, to bind experiences with reality. We want to inspire children to ask their own questions. Children have to look for the answers themselves to gain insight in the material and are challenged in several different ways. 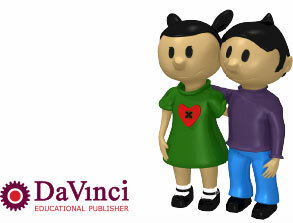 The lessons, provided by DaVinci, take different learning styles into account. For example, one lesson can start with a story while another lesson starts with a science experiment. Using this approach does not only emphasise reading comprehension, so all children can show how well they understand the material. We respect different talents and interests, for individuals and groups as well as their personal learning styles. Processing the information from the central lesson is done on an individual level, in groups or with the entire class. Principles from cooperative learning are used to provide additional values for working together. Horizontal and vertical differentiation is accomplished in the curriculum, because children must work independently and choose their own assignments. The teacher can work with certain assignments from, for example, a work block. This work block is comprised of several assignments. All assignments will be gathered in an unique portfolio, so that children can look at their previous work. For each theme, children make a thematic work piece whereby they can choose how they tackle the subject matter. Children can work with clay or make a written report. Eventually, it results in a work piece that triggers pride. For example, about an animal from the prehistory or about an instrument from the first humans in the prehistory. The work piece can also be interdisciplinary and covering two or more themes, for example, differences or similarities. Read more: Vision and Philosophy.